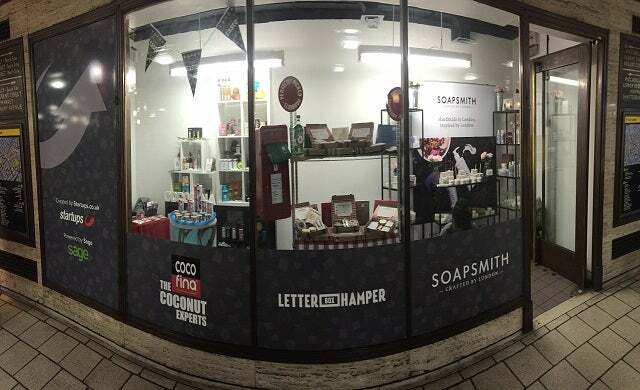 Last week, Startups.co.uk and Sage ran the #startupspopup shop competition where we gave Cocofina, Letter Box Hamper, and Soapsmith the chance to open their own pop-up shop at London’s iconic Piccadilly Station. 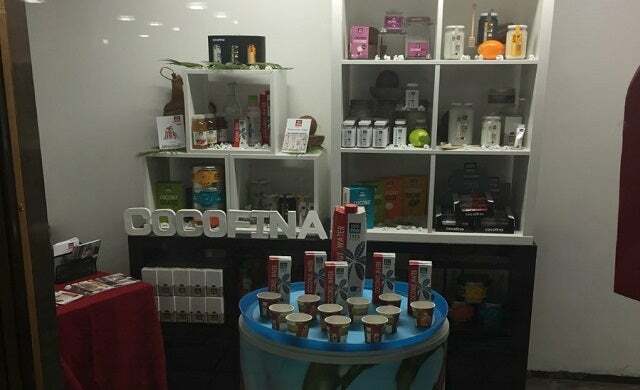 Cocofina was able to give away thousands of samples of its products to potential customers, Letter Box Hamper was contacted by a great lead on the back of the campaign, and Soapsmith secured impressive press coverage after being recognised at the pop-up, while all three businesses benefitted from increased sales and web traffic. Why set-up a pop-up shop? Setting up a pop-up shop is a relatively low-cost way to test new products, boost your brand and, for businesses that don’t have an offline presence, allows you to get a taster of what it would be like to run an actual bricks and mortar store before committing to a lengthy lease. Renting short-term retail space gives you and your business the opportunity to be more creative and test out different ideas. 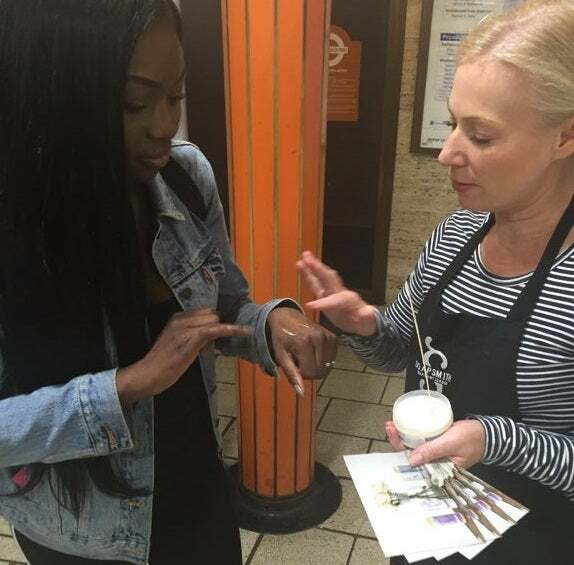 For instance, like Cocofina with its coconut oil sachet samples; you could provide free samples of food and drink products, or follow Soapsmith’s lead with its tester hand creams and let passers-by try out your product with no obligation of a purchase. In a world where businesses are increasingly migrating online, pop-up shops offer a way to engage with your customers face-to-face, build relationships, and give your brand that all-important human element. The most important factor to consider when setting up a pop-up shop is where your pop-up should be based. Primarily, you should look for a pop-up that receives a decent amount of footfall on a daily basis to expose you to your target market. For example, one of the reasons Startups.co.uk and Sage chose London’s Piccadilly Station as the site of the #startupspopup was because almost one million people pass through it every week. You should also focus on choosing a location that fits your brand and consider competition– there’s no point selling skateboards in Sloane Square. The pop-up shop space itself should also be a good aesthetic fit for your company and what it does – there are plenty of unique and quirky locations available so don’t just go for the first one you find. You can also give your pop-up shop a heavily-branded makeover to ensure maximum awareness. With the #startupspopup we used vinyl covers (see picture above) – that aligned with Startups and Sage branding – to promote the space. Do your research: speak to other businesses that have set up pop-up shops in the space before. Were they successful? Check the provider is a reputable firm that’s not making false promises or looking to rip you off. It’s also good to check if the area is easily accessible by public transport. You’ll also need to consider shop insurance before opening a pop-up shop. Check out this guide for everything you need to know about shop insurance. It’s now easier than ever to set-up a pop-up, with a number of companies disrupting the market by offering short-term retail space online at the click of a button. We used Startups 100-featured retail marketplace Appear Here to source our pop-up shop location in Piccadilly as the site offers a variety of short-term space in key retail locations but you can also look into marketplaces such as We Are Pop-Up and Boxpark to find unique temporary retail space (NB: These are primarily focused on London). 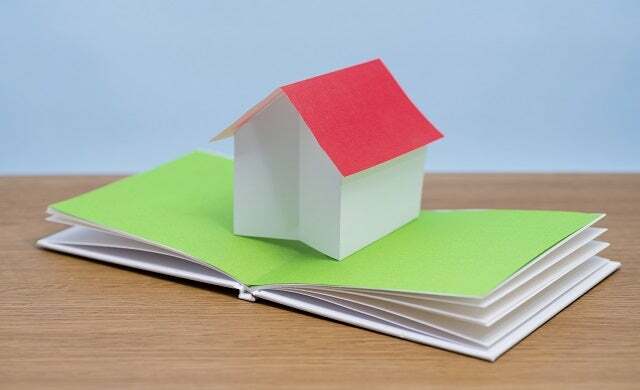 You’ll also need to set aside some cash for utilities, insurance, and kitting out the space – which could include furniture, painting, lighting etc. – and marketing materials (samples, leaflets and testers for instance). With the #startupspopup competition, we gave Cocofina, Soapsmith and Letter Box Hamper a budget of £500 to kit out their shared space. Remember that you’ll need to enable customers to buy from you – you could rent a card machine, or buy a cheap mobile card reader that works with an app on your phone. You’ll also need to consider how you’re going to staff the pop-up. Will you employ temporary staff to help you, man the shop yourself or even get family and friends to help you? Work out how much you want, or need, to budget for each area of your pop-up before you commit to a space – you don’t want to rent one and then not be able to fill it. 3. Marketing, marketing and more marketing! Getting a pop-up shop presence on the high street or at a key commuter location, doesn’t necessarily guarantee that your pop-up will be a success. You need to encourage passers-by to become punters. Of course the cornerstone of any successful pop-up is a vibrant front window display. This is a chance to create a visual feast that tells the story of your brand and catches the attention of idle eyes, drawing people in with an expectation of what you’re all about. 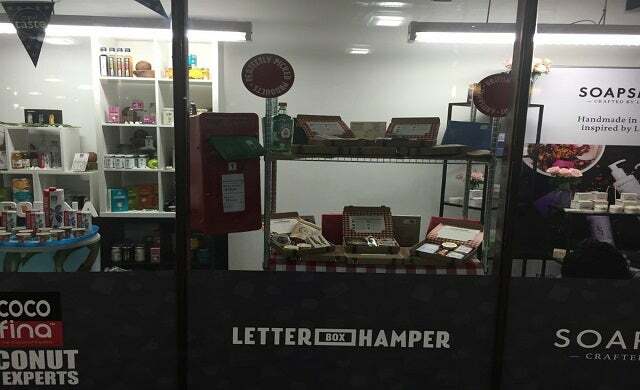 You can also generate a buzz for your pop-up shop online by posting on media pages for the local area or advertising to your followers on Facebook or Twitter and encouraging them to come down. Try to capitalise on any partnerships you may have with local councils and organisations who can help spread the word. It’s also worth remembering not to discount the humble flyering approach as it’s still a highly valuable tool when it comes to generating local interest. Like the window display, flyers should make people excited about your brand – make the most of the opportunity to advertise special offers or discounts. As well as shared pop-up space and a £500 budget, #startupspopup promoted its winning start-ups across the Startups.co.uk website, in email newsletters, and in a number of posts to our 68,000 fans on Twitter and Facebook to drive awareness and encourage consumers to support the campaign. 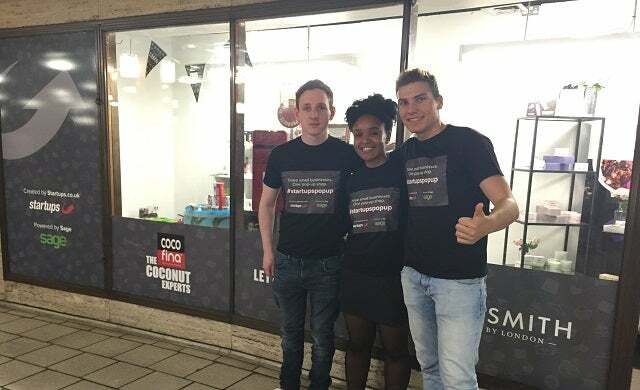 We also made the most of branded t-shirts to attract attention to the shop (as you can see in the photo above!). You should also try to generate interest from bloggers and vloggers in your space and persuade them to come to your shop. Soapsmith was able to attract the custom of high-profile vlogger Patricia Bright (who has a million subscribers to her YouTube channel and over 60,000 followers of her @PattyLovesU Twitter feed) to try out some of its hand cream samples when they caught her passing by; think about the potential traffic you could generate by getting several big-name bloggers and vloggers to check out your brand. Generally the three core goals of a setting up a pop-up shop should be to raise brand awareness, generate sales or explore new revenue streams, and engage with customers directly. Don’t just set up a pop-up shop because you’ve noticed that your competitors are doing it or because it’s become the “in thing”, you should have a good reason for wanting to open a pop-up. Go in with a purpose and make decisions that help steer you towards your goal as these decisions will inform everything from location, to your sales and marketing strategy. It’s important to be clear with yourself, your employees, and anyone else who has a stake in your business, what exactly it is that you are trying to achieve with your pop-up shop so that everybody is moving in the same direction.